Shelter In A Day's disaster relief house is ideal for those displaced by natural disasters, such as hurricanes, earthquake or floods. Our eco-friendly shelters provide safe and secure homes that are termite, water and rust resistant. Shelter In A Day's disaster relief home can be easily erected in one day without tools or electricity. Our test model disaster relief house (recent picture above) has withstood harsh Florida's elements for more than two years beautifully. Shelter In A Day is designed to last. Shelters are solidly constructed with a new patented Tool Free Joint and interlocking panel edges. Shelter's patented technology - a first for a home - ensures a solidly constructed shelter that's also easy-to-assemble. Because our disaster relief homes are made from 100% recycled wood fiber material, much like man-made wood, the grain structure runs in every direction, making the structure much stronger than natural wood and very long lasting. What kind of foundation does a shelter need? Foundations can be made in a variety of ways. The Shelter can be placed on an existing concrete slab or on local materials like stone, rubble, concrete block or pavers and even mud brick. Because of its unique design, our shelters don’t need a “perfect” foundation. They are sturdy wherever they are constructed. How is the Shelter anchored? Screw-type earth anchors can be hand installed around the base or cast into a concrete slab. Steel straps connected through exterior wall members will secure the Shelter for high wind protection. All internal and external support members are drilled so temporary extensions can be added or possessions can be tied to a wall or under the roof. What kind of roof is on a shelter? The Shelter roof is structural but not waterproof. Shelters can be shipped with a 5 gallon can of roof waterproofing. This painted membrane will protect the roof and is light and reflective but the structure cannot be taken apart after this application. If you want the option to move the structure, a mil-spec tarp can be supplied and tie-downs for it are built into the standard structure. How do I put together a home without tools or electricity? Shelter In A Day’s new patented Tool Free Joint reinvents a simple carpenter style joint with a locking peg that is very easy to assemble. Simply use the included wooden hammer and merely tap these secure pegs into place. How long does it take to build a shelter? Shelters In A Day's disaster relief housing can be built in less than one day without tools or electricity. We built one in 3 hours using only muscle power. Watch this quick video and witness, how easy Shelter In A Day is to construct. What makes a Shelter In A Day a green home? 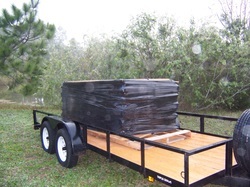 Shelters are made from 100% recycled wood fiber material and precisely cut with the latest computerized technology to minimize waste. How big is the shelter? The base model shelter is 12’ x 12’ but can be expanded in 4’ increments, 12’ x 16’, 12’ x 20’, 12’ x 24’ or long as you needs require. Can shelters be used for long-term use? Shelters are safe and secure and come equipped with lockable doors and windows. All shelters are also borate treated for termite and fire resistance and waterproof. The wood fiber material can be favorably compared to solid wood, only stronger and will last as long as it’s taken care of. What if I want furnishings for the shelter? 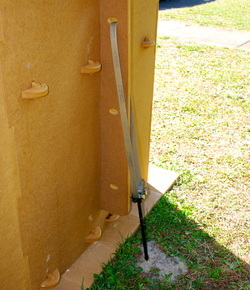 Shelter In A Day’s same patented Tool Free Joint is also used to craft Terrapeg eco-friendly furniture. With more than 30 attractive designs, Terrapeg’s appealing and durable, green furniture offers everything needed to furnish a shelter. ping container, 16 in a 40'. Yes. Shelters can be taken apart, moved to a different location and reused. What color is the shelter? Shelters are a natural caramel wood color but can be easily painted to suit your needs. Is the Shelter really patented? Yup you bet it is! Shelter in a Day has received a Patent from the U.S. Patent and Trademark Office. This Patent, introducing a new way to build using GREEN fiberboard materials and using our easy to assemble Tool Free Joint, has profound implications for Disaster Relief, Eco-Friendly, immediate and affordable housing needs worldwide. How much does Shelter In A Day cost? A base model 12’ x 12’ shelter (144 sq. ft.) is $4,990 USD. All hardware is included to build an entire shelter including doors, windows and combination door locks. Shipping information is 4’ x 8’ x 3' on a pallet. Approximately 3,000 pounds. Add 4’ to the length (12’ x 16’) is an additional $950 USD. 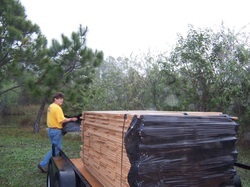 Shipping information is 4’ x 8’ x 42” on a pallet and an additional 600 pounds. A paintable membrane roof is $100 USD and a typical steel or canvas roof is about $300. Earth-anchor type tie-downs start at $100 for a 12’ x 12’ shelter. All prices are FOB our facility near Ft. Myers, Florida. 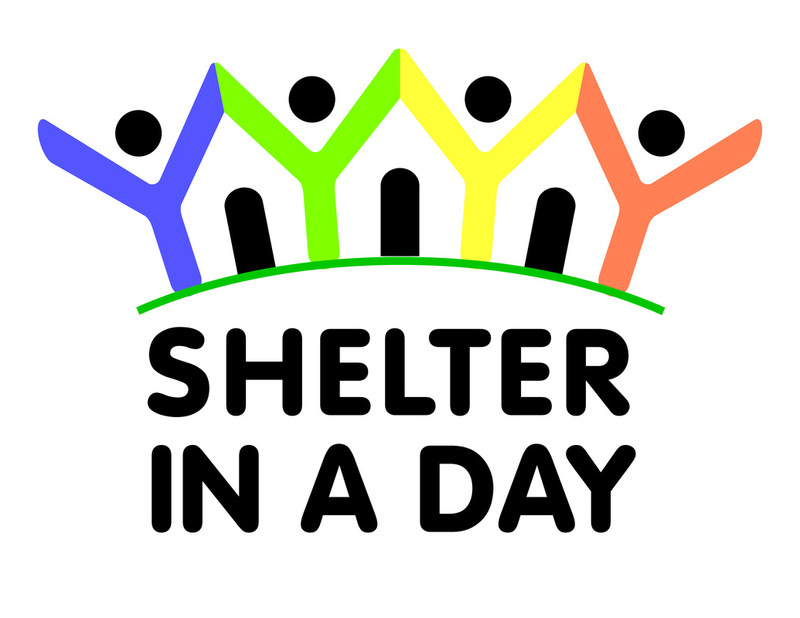 To learn more about how Shelter In A Day came to be, visit our About or read our Disaster Relief Housing Blog for the latest news and tips.